Swim Plugz for children have been designed specially for use whilst swimming. The pack contains 3 pairs of children's plugs complete with individual safety cords. Each pair has own safety cord. Prevents water from entering the ear. children's size. Adult size available here. 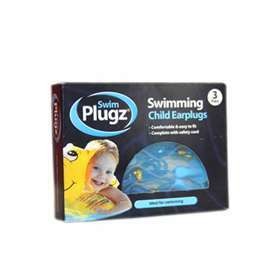 Swim Plugz by Hush Plugz are specialist earplugs designed for children for use whilst swimming. The earplugs prevent water going inside the ear canal, which is a common cause of ear infections in children. 3 pairs of earplugs are included in the pack, each with their own safety cord to prevent loss. Gently pull the top of the ear upwards and outwards to help open the ear canal. Insert the rounded end of the ear plug into the ear and hold in place until secured. Once fitted correctly the plug will feel comfortable and provide ear protection. Keep out of the reach of children when not in use. These ear plugs should not be used where there is a risk of the cord getting caught up.